On the eve of the anniversary of our Independency, Colonial Revelers will perform the music of Mr. William Billings and Mr. John Cole during Sunday morning services at St. Matthews. Colonial Revelers will provide 18th century songs from 11 to 1 at the Speaker's House Living History Day, a BBQ fundraiser for the restoration of the Frederick Muhlenberg House. Lunch will be pork BBQ, cole slaw, corn-on-the-cob and soft drink. Activities include colonial cooking, music, spinning, dying, weaving, blacksmithing, woodworking, military demonstrations and tours of the house. Tickets are $10 for adults, $7 for seniors, $5 for kids 6-12, and free for children under 6. Frederick Muhlenberg became the first U.S. Congress Speaker of the House in 1789. 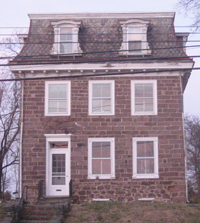 The house was built in 1760 and purchased by Muhlenberg in 1781. He was born and grew up in Trappe. The house of his father, Henry Melchior Muhlenberg, has also been restored by the Trappe Historical Society. Henry was a Lutheran pastor sent to Pennsylvania in the 18th century as a missionary. Besides Frederick, his sons included Major General Peter Muhlenberg of the Continental Army. Sons-in-law were also generals and politicians, and one grandson became Governor of Pennsylvania. FYI: The Keystone Grange Fair is the same day, not far away on West 1st Avenue, 9 am-7 pm. Come and spend the whole day in Trappe! We would be pleased to see you this month.